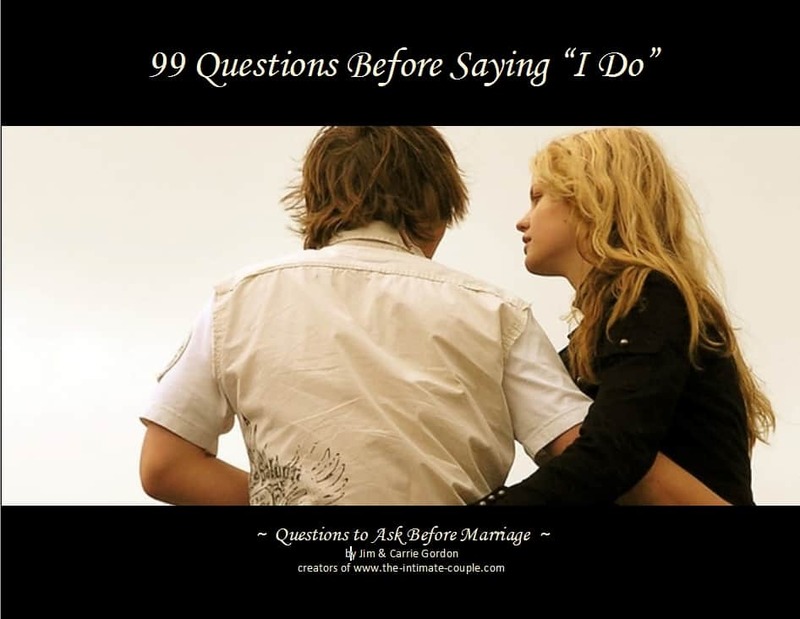 We’d like to introduce engaged or seriously dating couples to our e-book that’s packed with lots of important pre-marriage questions: 99 Questions Before Saying “I Do”! If there is one thing that can be done to stem the tide of marriage failure, it is Marriage Preparation. One of the key components of this preparation leads to getting to know your partner better than anyone else on the planet! Become an Expert of Your Spouse-to-Be! Preparing yourself for marriage—becoming an expert on your spouse—comes by learning more about them. This happens best by using a list of questions to ask before marriage … and that is what this e-book is all about! Do you have a son or daughter who is in a serious dating relationship or engaged to be married? Do you have a friend who is preparing for an upcoming wedding? Then this e-book is a timely gift for you, your son or daughter, or your friend! Get a copy of this ebook for $9.90 … only 10 cents per questions! Once you’ve completed your online “purchase”, you will be given a link that allows you to IMMEDIATELY download your copy of 99 Questions Before Saying “I Do”. The pre-marriage questions e-book is in the Adobe PDF file format. If your computer doesn’t have the Adobe Reader software, you can easily install it for free.